For Telesur TV English Edition, Prof. Jose Maria Sison, ILPS Chairperson, presents the Presidential Elections of 2016 and the Danger of Civil Strife Due to Cheating by the Ruling Party. Of the four major presidential candidates in the Philippine elections to be held on May 9, former Davao City Mayor Rodrigo Duterte is now widely considered the frontrunner as he has topped all the major polls in April, performed well in presidential debates and has gathered the biggest and most enthusiastic crowds in all the regions of the Philippines. Running as the Philippine Democratic Party-People’s Power candidate, he has surpassed his political rivals by strongly calling for change and castigating the Liberal Party Benigno Aquino III government for corruption and condoning criminality, particularly the spread of illicit drugs all over the country down to the village level. He has impressed the public with his successful record of stamping out organized crime and delivering social services in his home city. He has endeared himself with his audiences by using populist street language and cursing the worst of the oligarchs. He has overcome human rights violation accusations in the course of suppressing criminal syndicates and of being too close to the Communist Party of the Philippines and the New People’s Army which are strong in his home province. He has fended off the anti-communist attacks by asserting that he is a socialist and that he can be relied upon to negotiate and forge a just peace with the revolutionary forces as well as with the Muslim rebels within the framework of federalism. He has a reputation for being honest and for shunning corruption. But in the homestretch of the electoral campaign, Senator Antonio Trillanes, an ally of the corrupt Aquino government and a former naval officer and mutineer fabricated bank records to misrepresent Duterte as having accumulated hundreds of millions of pesos. The Bank of the Philippine Islands as well as the Central Bank of the Philippines and the Anti-Money Laundering Council denied the authenticity of the forged documents. Senator Grace Poe used to be the frontrunner in the presidential campaign until March. Her Independent Party was seen as critical of the Aquino government. 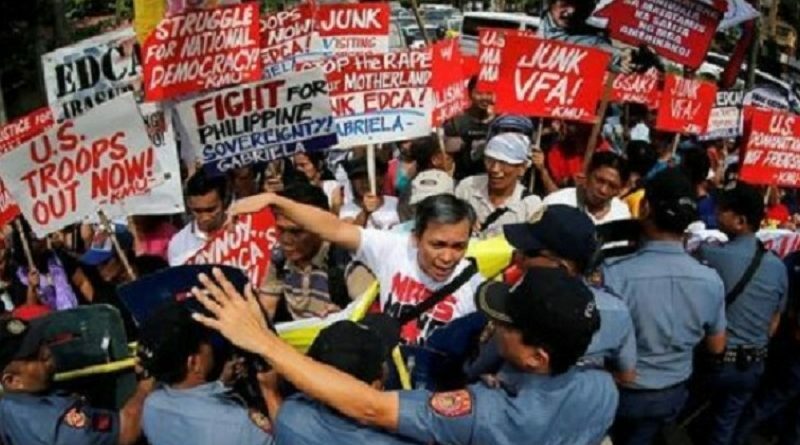 It gained the support of the Rightist Nationalist People’s Coalition and the Left Makabayan (Patriotic) Coalition. But Poe has not gone beyond criticizing a few subordinates of the incumbent president. A number of times she has expressed the support for the long-discredited hypocritical “straight path” policy of Aquino and has even said she would make him her anti-corruption adviser should she win the presidency. Thus, Duterte was able to seize the initiative by categorically and vigorously opposing the Aquino government for its corruption, condoning of criminality and the increase in unemployment and poverty in the country. Long before the electoral campaign period began on January 9, Vice President Jejomar Binay was the frontrunner in polls but eventually was weighed down by charges of corruption against him and other members of his immediate family in the government. He has gone down to third in polls. His political decline has been engineered by President Aquino himself who favors his friend and Cabinet member Mar Roxas, the previous head of the Department of Interior and Local Government. But in polls and in terms of crowd attendance, Roxas has come in a poor fourth. He suffers from the traditional kiss of death of an outgoing discredited president. He is known for incompetence and mismanagement of the police forces. He is widely ridiculed for having photographed himself clumsily mimicking workers, carrying a sack of rice or driving a pedicab, and for having no program to solve social and economic problems. The late Roxas had been a notorious puppet of the Japanese fascist invaders but was reinvented by General Douglas MacArthur as a double agent of the US at the end of World War II. Mar Roxas is also a scion of the big comprador and landlord Araneta family. He takes pride in having gotten his economics degree from Wharton School in the US He is a dogmatic exponent of the neoliberal economic policy and, like the current president, wants to perpetuate the dominance of US multinational firms and US military forces over the Philippines. Despite the fact that Roxas rates low in major polls and in gathering crowds, both he and President Aquino are confident of winning the presidential elections through electronic fraud. They can have the fake electoral results pre-programmed and embedded in the Smartmatic vote counting machines. The Commission on Elections is composed of Aquino appointees and headed by Andres Bautista, a cousin of Aquino and a former electoral campaign planner to Roxas. Most important of all, the Smartmatic company is controlled by the CIA through the SGO holding company whose chairman is Lord Malloch Brown, a long-time, top.level British intelligence operative masquerading as a public relations expert. He was the political adviser to Cory Aquino from 1985 onwards. He was assigned by the CIA to countervail the earlier assignment of the Black, Manafort and Stone public relations firm to the dictator Ferdinand Marcos. While it is easy for Aquino, Roxas and the CIA to cheat in the presidential elections through the Smartmatic, they are playing with fire. The electoral fraud will certainly ignite the outrage and resistance of the broad masses of the people who are already suffering from severe exploitation and oppression and want revolutionary change. Armed resistance will arise from the millions of Duterte followers who are likely to ally themselves with the growing revolutionary forces and the Moro armies in Mindanao. Professor Jose Maria Sison is Chairperson of the International League of Peoples’ Struggle.